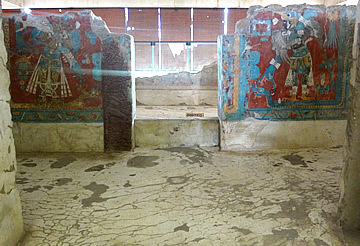 An intriguing matriarchal site and some of the best-preserved Mesoamerican murals we have seen. The Spiral Pyramid of Xochitecatl, built around 300AD. A very ancient site dating as far back as 1000BC, Xochitecatl seems to have been a matriarchal society with many artefacts in the on-site museum devoted to childbirth and babies. The reasoning behind the famous circular spiral pyramid is not really known: was it built this way to make it easier for pregnant women to get to the top - but it's an awful long way to climb going around the spiral. However, no set of steps has been found to ascend the structure. 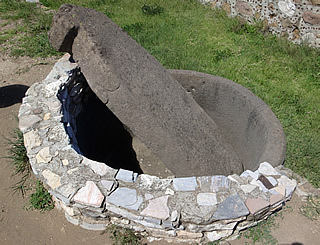 The spiral shape is linked to the god of the wind, Ehecatl, or the structure may have been an astronomical observatory. 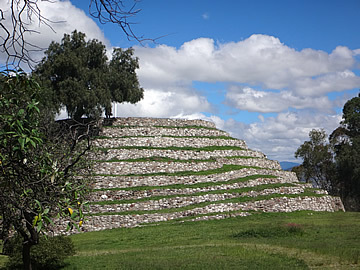 The major pyramid, Pyramid de las Flores or pyramid of the Flowers, rises on the eastern edge of this elevated site overlooking the ruins of Cacaxtla. 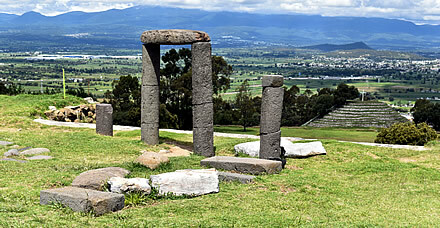 Between are the smaller Serpent Building and Platform of the Volcanoes. Pyramid de las Flores seen from the Spiral Pyramid; in front is the Platform of the Volcanoes and to the right the Serpent Building. On top of the Serpent Building. It is speculated that the temple was used in relation to water rites. 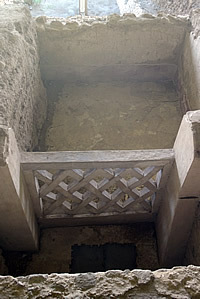 Stone basin found on the Serpent Building. Inside were three stone carvings: a serpent's head (seen in situ), a person in the form of a jaguar, and a man with a sceptre. 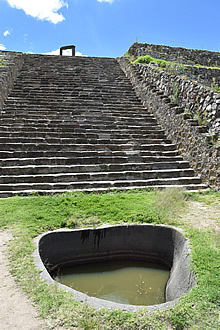 At the bottom of the steps is a pool sunk into the ground and a large stone pot, to the right a stone altar. 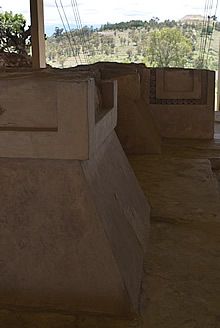 Pyramid de las Flores was realigned to the Cacaxtla palace in the Epiclassic, indicating that the two sites were linked and the ceremonial site of Xochitecatl was controlled by the Cacaxtla elite. The remains of thirty infants were found here, either sacrificial or died during birth. A small site but intriguing for its evocation of a matriarchal society and the unusual Spiral Pyramid. 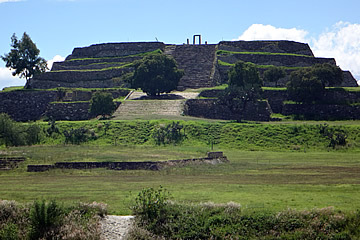 Cacaxtla on its hilltop site seen from Xochitecatl. 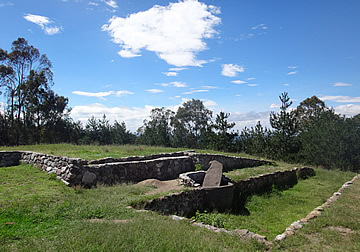 Standing very close to Xochitecatl, Cacaxtla is another hilltop town, though of much later vintage, peaking in the Epiclassic around 650-950AD. In the Classic Period the two centres of Mayan civilisation at Tikal and Calakmul fought for supremacy. 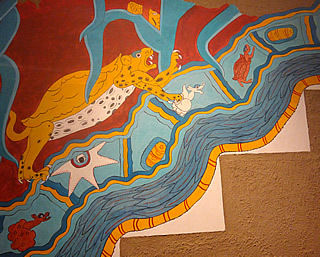 A wide-ranging side-effect was the formation of alliances throughout ancient Mexico. 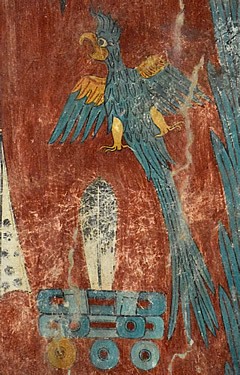 This male figure has a mask covering his face and a scorpion tail. 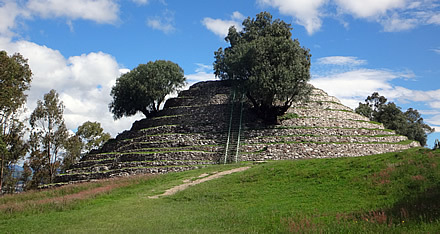 Cacaxtla, about 25 km north west of Cholula, was another hilltop fortress site. Like Cholula it was occupied by the Olmec-Xicallanca, a southern Gulf Coast people.1 The palace complex of the town, flourishing in the 7th and 8th centuries, was a series of flat-roofed buildings grouped around patios and plazas. 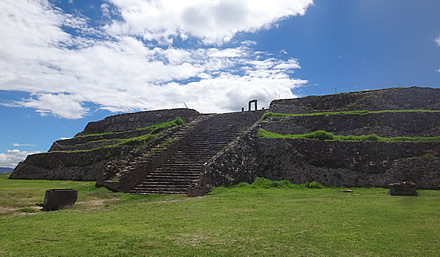 Cacaxtla is built on the talud-tablero style which is synonymous with Teotihuacan, the dominant city for hundreds of years until its fall in the seventh century. This figure is thought to be female. 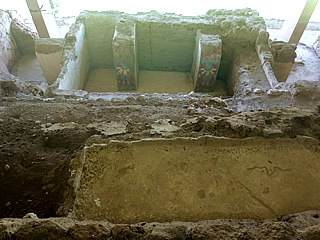 In this small enclosed room on the eastern side of the complex are two columns each painted with a figure wearing a short skirt bearing the symbol of Venus, associated with war and sacrifice. 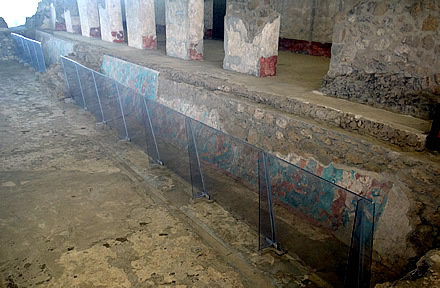 The palace complex has some of the best-preserved murals of any ancient Mesoamerican culture. 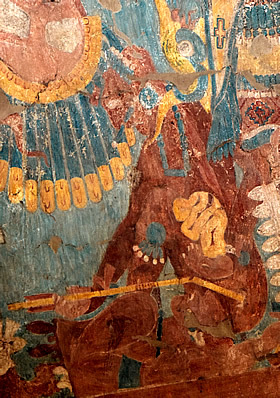 These extensive vibrant Epiclassic murals cover walls throughout the palace. On the east side fragments adorn columns of the Venus Temple, full of symbolic meaning which we can only guess at today. 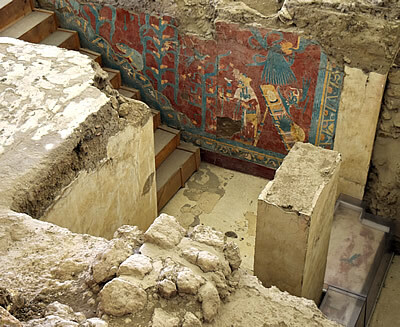 Nearby a subterranean room called the Red Temple has magnificent murals on the walls of a staircase. Only one is visible to visitors but both a reproduced, along with many others, in the on-site museum. 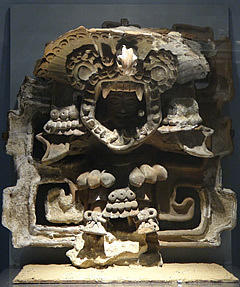 Mayan influence can be detected in, for instance, the naturalistic body proportions and poses, ceremonial serpent bars, a toad symbolizing the Mayan 20 day time period, the Mayan maize god, though many Mesoamerican cultures had a maize god. 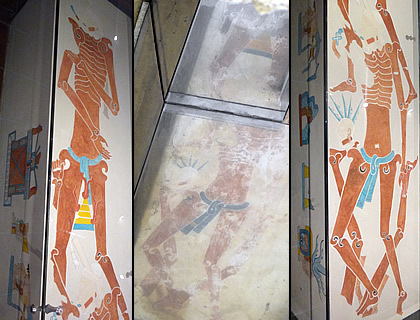 Step paintings of skeletons in the Red Temple and reproductions in the on-site museum. 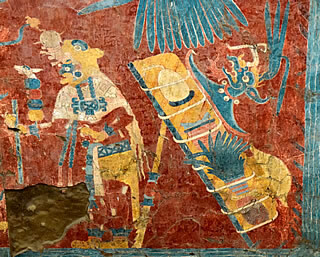 Cacaxtla mean "place of the carrying frame" and one is depicted in the wall mural: a large frame carried on the back used to transport goods tied on with ropes. 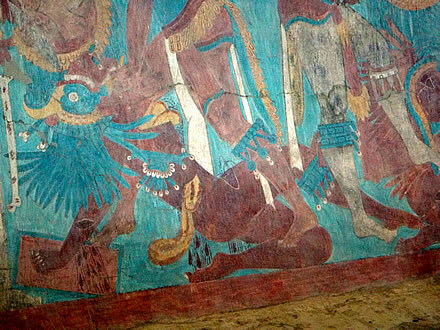 On the bottom step of the Red Temple paintings of skeletons show ribs and articulated joints. 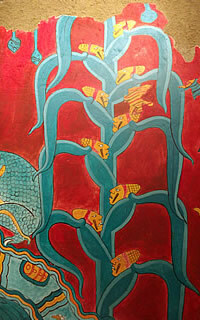 The heads of the Mayan maize god on the maize plant can more easily be seen in this reproduction in the on-site museum. This latticework wall looks surprisingly modern. 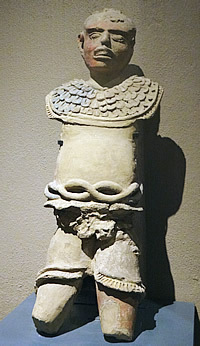 This rather crude sculpture in the on-site museum nevertheless shows well the typical dress of the period: a feathered breastplate, loincloth and plaited belt. 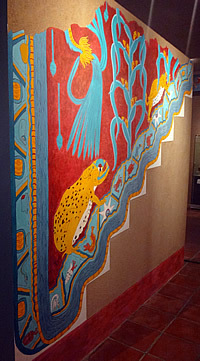 This mural stands opposite the mural with the Mayan god of merchants on the staircase but is not visible to the public. On the horizon is the Temple de las Flores at Xochitecatl. A strange jaguar-turtle composite creature. 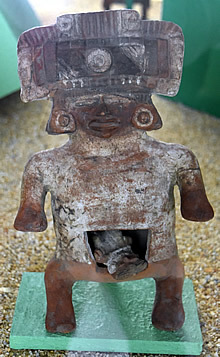 This clay figure shows a priest dressed as the bat god murcielago for a ritual ceremony. 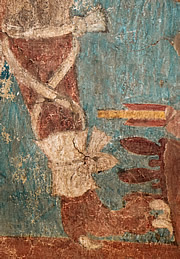 The face of the priest can be seen through the open jaws. 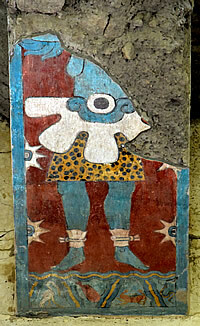 The use of a vegetable binder for the pigments is also a traditional Mayan and Gulf Coast technique, unknown in central Mexico where a true fresco technique of painting pigments on fresh plaster was used. Eagles and jaguars feature prominently, in particular in a battle between jaguar-clad and feathered warriors. 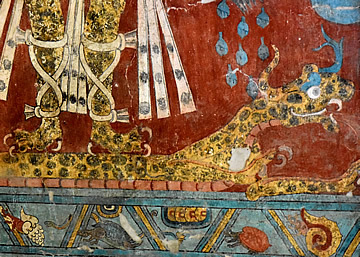 The jaguars have Mexican features and are always victorious, while the eagles are dressed in Mayan style clothing from an older time and are defeated. 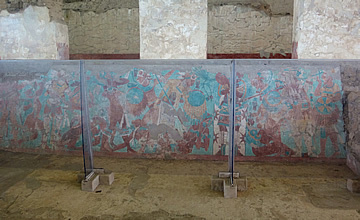 Over 20 metres long, the Battle Mural is protected by screens. 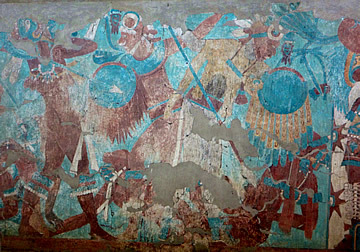 The famous Battle Mural is painted on the talud of a large building with a pillared portico. 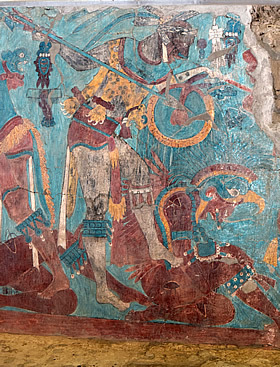 As with all Mesoamerican art, natural pigments were used to give many colours such as the family of ochres achieved by mixing iron oxide (limonite) from soil with clay or sand to give shades from yellow, through orange and red to brown; black from charcoal, blue and green from copper oxide and whit from lime/sand stucco. On the extreme left of the scene a furious battle rages. A relatively static figure watches over the battle. 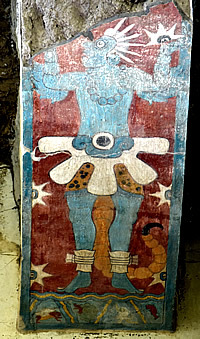 The figure seems to be standing against a white-painted slab with eye of Venus symbols; Venus was the god of war. 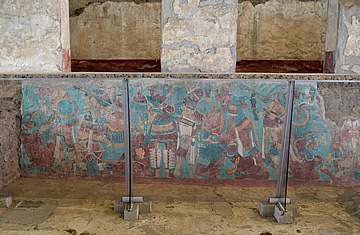 The mural is divided by a staircase leading to the upper floor of the building which is fronted by rectangular pillars. Some figures look quite static, watching over a riot of action with some gory details, "jaguars" battling "eagles" for supremacy. Often the victors are depicted standing with one foot on their defeated opponent who bleeds from many wounds. 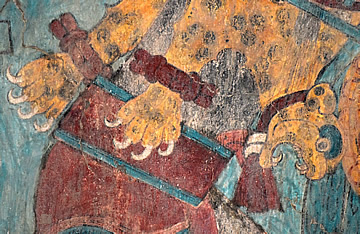 A triumphant "jaguar" stands above a fallen "eagle" ready to inflict the killer thrust of his spear. A wounded warrior attempts to push intestines back into his body. 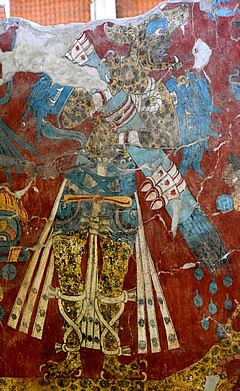 A warrior with jaguar claw feet. Wounds are graphically portrayed: cuts to an arm flowing with blood, chest and abdomen spilling blood and intestines. 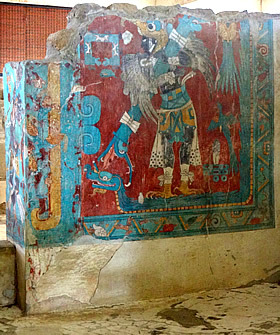 Not far from the Battle Mural the entrance to a room is flanked by two magnificent murals of a Bird Man and a Cat Man, jaguar and eagle. Left door jamb with jaguar figure. 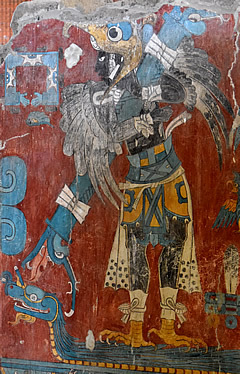 The figure on the right is painted black, has eagle feet and wears an eagle costume. 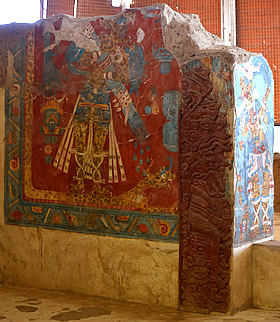 He also carries a ceremonial bar standing on an elongated feathered blue serpent, perhaps representing Quetzalcoatl. 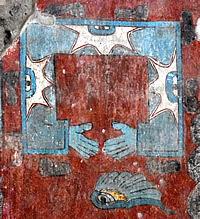 The jamb on the right side bears a dancing black figure carrying a conch shell from which a red-haired figure emerges. The murals are truly spectacular, I wish I understood more of the, sometimes very weird, symbolism! Black footprints surround a broken hollow square with two hands (two arms?) decorated with eye of Venus symbols. 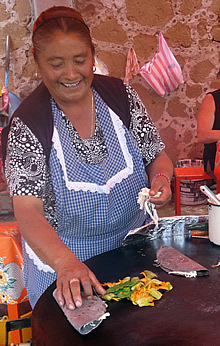 When we left the site we were hungry so stopped at a street vendor to have freshly made black tortillas stuffed with cheese, bacon and courgette flowers - they were very good!